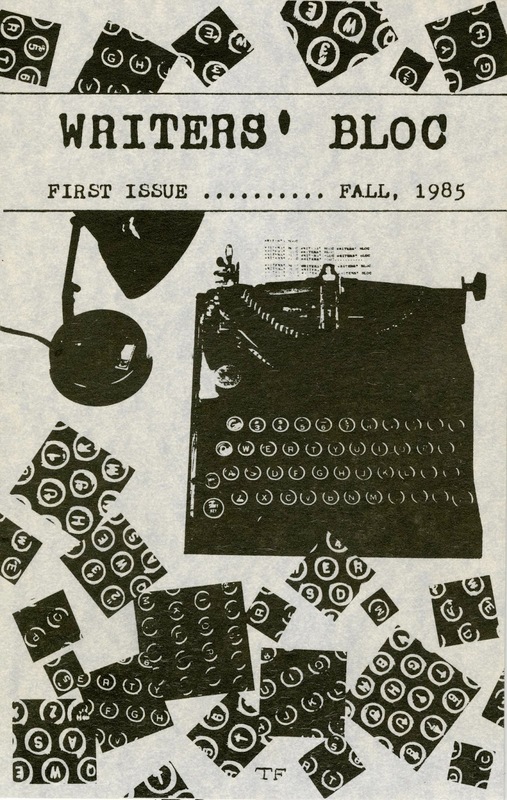 Oberlin student publications at the College Archives range from 1858 to the present, in nearly 200 titles. With this exhibit of selected print issues, we also launch the first digital exhibit from the collection, a project primarily completed by Kira Zimmerman ‘19. Archives is pleased to announce that the Geoffrey T. Blodgett Papers (record group 30/263) has been processed, and is now ready for access by researchers. The finding guide can be found from the Archives home page by clicking the blue box for "Browse our Finding Guides." Then type Blodgett in the search box. "Jeff" Blodgett (1931-2001; OC 1953) was an esteemed and beloved faculty member in the History Department from 1960 to his retirement in 2000. He became the college's unofficial historian following the unexpected death of his mentor, Robert S. Fletcher, at the age of 59. 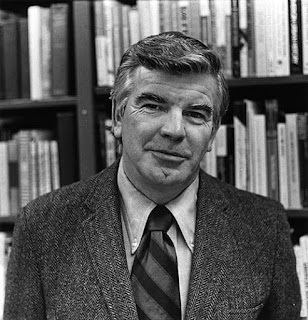 His teaching was described as superlative, and his scholarship resulted in numerous articles as well as several books, among them Oberlin Architecture, College and Town: A Guide to its Social History (1985), and Oberlin History: Essays and Impressions (published posthumously in 2006). Processing the Blodgett Papers involved the Associate Archivist, Anne Salsich, the Archives and Special Collections Intern, Becky Sparagowski, and student assistants Rachel Marcus (OC 2020) and Kira Zimmerman (OC 2019). 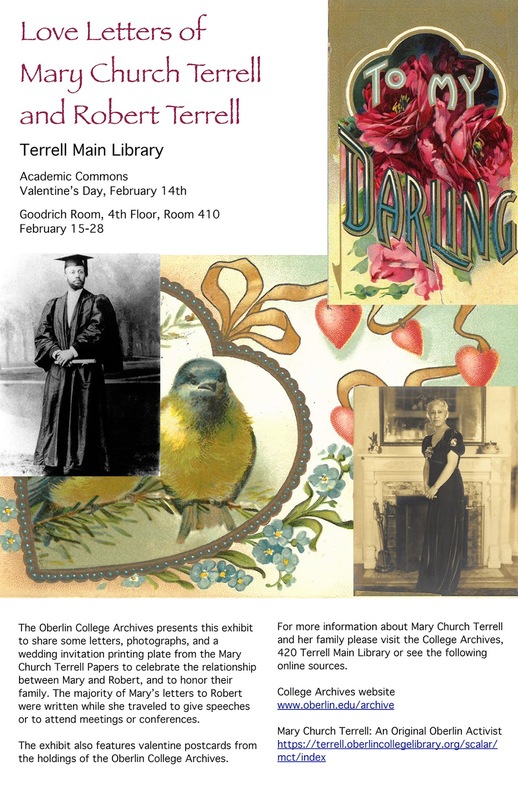 Visit our new exhibit for Valentine's Day! Associate Archivist Anne Salsich's article, "Sanctuary at Oberlin: The Archives bear Witness," was published in the current November/December issue of Archival Outlook, the news magazine of the Society of American Archivists. The cover features one of the images in the project, a poster made by Oberlin students in response to the May 4, 1970 killings at Kent State. The article begins on page 6 from the link above. See the Oberlin Sanctuary Project from the Oberlin College Archives website. In the current issue of Archival Outlook, published by the Society of American Archivists, College Archivist Ken Grossi co-authored an article reporting on the status of Project STAND (Student Activism Now Documented). Welcome to the 2018 Artz Scholars! This exhibit will be in the Mudd Learning Center's Academic Commons during Library open hours. The newest stories to be developed in the Oberlin Sanctuary Project (https://sanctuary.oberlincollegelibrary.org/) presents the Carpenters for Christmas (1964) and Kent State University Shootings and Oberlin College (1970). See materials relating to your years at Oberlin! Nearly twenty colleges and universities around the country have joined to launch Project STAND, an online hub to heighten the awareness of archival and historical collections documenting student activism around the United States. STAND will focus on digital and analog primary sources that document the activities of student groups that represent the concerns of historically marginalized communities (e.g., African American, Chicano/a, LGBTQ, religious minorities, disabled etc.). STAND will also highlight the work of others (e.g., faculty, staff, administrators, and alumni) who advocate for or support the interests of those communities. The project was established in the fall of 2016 to bring together academic institutions from across the state of Ohio but has since broadened and includes representatives from Chicago State University, University of Illinois, The University of Michigan, South Carolina State University and Jackson State. The Oberlin College Archives joined the project in the fall of 2016. This exciting initiative was originally conceived by Lae’l Hughes-Watkins, University Archivist at Kent State University and Tamar Chute, University Archivist at The Ohio State University. Almost 120 collection assessments have been completed and the results show a wide variety of issues that inspired students to protest and to demonstrate, such as anti-slavery, the Vietnam War era, LGBTQ rights, anti-apartheid, civil rights and racial equality, and women’s rights. These collections are rich in correspondence, diaries, photographs, and posters. STAND provides an opportunity for reflection and discussion of the meaning and impact of the stories and events documented in the collections, both as a place in history and as an influence on our actions in the present. Some collections from the Oberlin College Archives highlighted in Project STAND include the online digital collection Oberlin and Activism and the Mary Church Terrell Papers. For more information about Oberlin’s participation in Project STAND, please contact Ken Grossi, College Archivist, at ken.grossi@oberlin.edu. For additional information please see the Project STAND website. Get a team together – or come on your own – for a family-friendly night of trivia! So you think you know your Oberlin history, your sports specifics, or your pop culture particulars? Find out how much you do know (or how much you don’t!) at this fun community event. Team size is up to you, but we think 3-6 people is ideal. New to Oberlin? Don't worry - the majority of questions are from beyond and even the Oberlin answers will probably sound familiar. Location: Fellowship Hall of The First Church in Oberlin, U.C.C. Access to the parking lot is off Lorain Street (on the west side of the church). Doors to the fellowship hall are at the northwest side of the church. Register yourself or your team from the Oberlin Heritage Center website today! On October 20 we will again host Dr. Nina Reid-Maroney’s students from Huron University College in London, Ontario for a session on Hiram Wilson, Oberlin, and the Underground Railroad. They will also have sessions with Ed Vermue, Special Collections Librarian and Julie Weir, Reference and Academic Commons Assistant, on relevant 19th Century anti-slavery materials in the Library. The Oberlin College Archives has been partnering with the History Department at Huron College for many years, and in 2013 that partnership resulted in a Huron College website in honor of Hiram Wilson and his letters at the Oberlin College Archives and the Amistad Research Center.